Ladies finger is one of my most favourite vegetables. 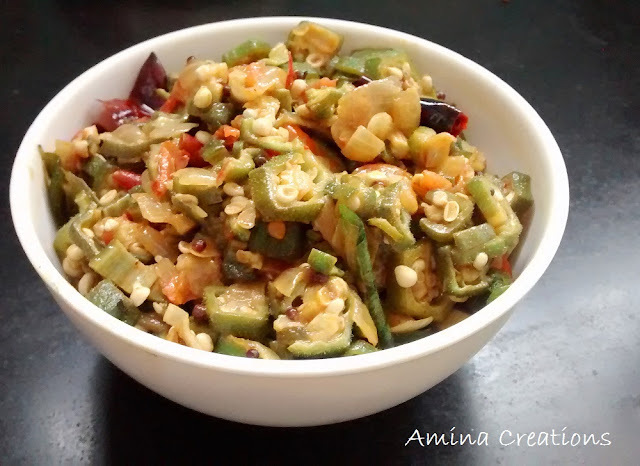 I like all recipes that have Ladies finger in them and this Ladies finger stir fry (Vendakkai/Bhendi poriyal) is a quick, delicious and nutritious stir fry that goes well with both chapathi and rice. Ideally served with sambar and white rice along with papad/appalams at home, this stir fry is a family favourite. Divide the sliced ladies fingers into two batches. Take a thick bottomed non-stick pan, and add a tbsp of oil. Add one batch of Ladies finger and saute for a few minutes till they change colour to bright green. Transfer to a plate and keep ready. In the same way, stir fry the second batch of Ladies fingers and transfer to the plate. Now, heat remaining 2 tbsp oil in the same pan, add mustard seeds and allow them to sputter. Add onions, curry leaves and dry red chillies and saute till the onions turn soft. Now add the garlic paste and saute for a few seconds till the raw smell goes. Add turmeric powder, red chilli powder and salt and mix well. Add the tomatoes and saute for a few minutes till they turn soft. Now add the stir fried ladies fingers and mix well. Add about 1 cup of water and bring to a boil. Then reduce heat, close a lid and cook for about 10 minutes while stirring in between. When all the water has evaporated and the ladies finger is soft and cooked, switch off the gas. Transfer to a serving bowl and serve hot with white rice and dal curry or with chapathi or any other variety rice of your choice. one of my fav veggies,looks delish!